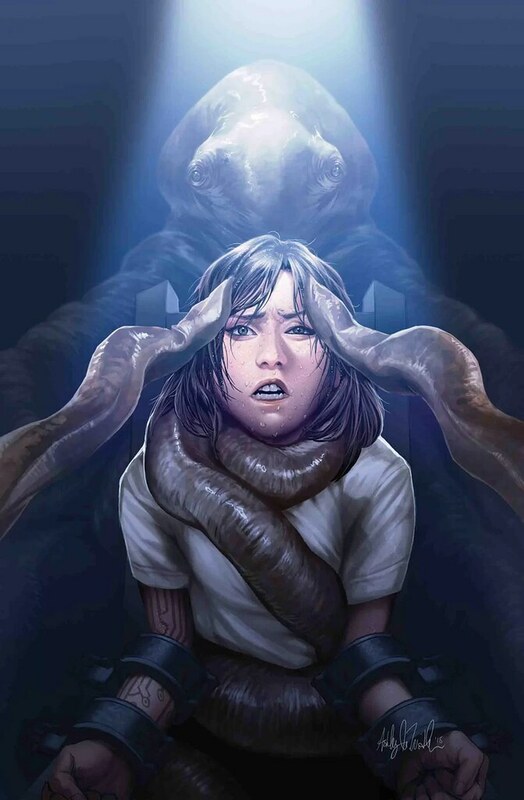 Doctor Aphra #22 continues the fun. First off, that’s not Bor Gullet on the cover, but Bor Ifriem, perhaps his cousin. But on top of that, we get an update on bounty hunter Tam Posla who is hunting Dr. Evazan. We find out the mystery of the weird Jedi ghost thing, it is indeed weird. Tolvan and Sana meet, which is kind of deliciously awkward. We get a devious glimpse of Triple Zero and BT. And through it all, there’s lots of laughs. In short order, another must read issue. It kicks off with Posla who is on his ship hunting for leads on Dr. Evazan. I was curious about the timeline as he mentions a scuffle on Tatooine, then I noticed that Posla actually has Ponda Baba’s severed arm in a jar, so this is post-A New Hope, which means they both might be alive. It’s a fun little bit, but ultimately it’s there to show that he is scanning com chatter and eventually finds something that leads him to Aphra. In turn, we learn Triple Zero is also listening in, thus he also learns of Aphra’s location. The scene of him and BT on a ship is chilling as there’s lots of gore and blood. Elsewhere, Tolvan and Sana meet, realize they’re both entangled with Aphra, and have some funny awkward moments. On top of all that, we learn the secret of the Jedi ghost thing. It’s a vicious mold that has fed upon the corpse of a Jedi, thus empowering itself to some new deadly level. That’s why it’s so weird and so unlike a Jedi, but similar. It sounds really weird, but it actually works well in the comic. I think it’s one of the better bizarre ideas in Star Wars. Oh, and we get some info on Bors and how they work, which is interesting for Bor Gullet fans. Storywise, this issue is very rewarding. The artwork is also great. Kev, Marc and Java have a great style going on that captures the characters and the action in very appealing visuals. It’s a little cartoony, but also detailed and object realistic (ie. ships and such don’t have the cartoon look, that’s reserved for the human characters). I like it. With great artwork and a great, entertaining story, this issue scores high on all levels. I give it a five out of five metal bikinis.